Heather Shumaker Archives - Joelle Delbourgo Associates, Inc. 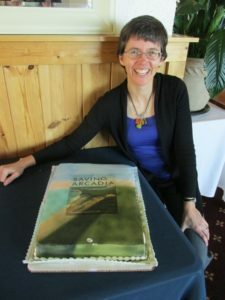 Author Heather Shumaker’s Saving Arcadia launch! Happy author, yummy looking cake! Apparently 60 copies of the book were sold at the book launch. Well done, Heather! 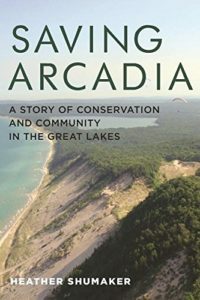 Saving Arcadia: A Story of Conservation and Community in the Great Lakes is a suspenseful and intimate land conservatio n adventure story set in the Great Lakes heartland. The story spans more than forty years, following the fate of a magnificent sand dune on Lake Michigan and the people who care about it. Author and narrator Heather Shumaker shares the remarkable untold stories behind protecting land and creating new nature preserves. Written in a compelling narrative style, the book is intended in part as a case study for landscape-level conservation and documents the challenges of integrating economic livelihoods into conservation and what it really means to “preserve” land over time. This is the story of a small band of determined townspeople and how far they went to save beloved land and endangered species from the grip of a powerful corporation. Saving Arcadia is a narrative with roots as deep as the trees the community is trying to save; something set in motion before the author was even born. And yet, Shumaker gives a human face to the changing nature of land conservation in the twenty-first century. Throughout this chronicle we meet people like Elaine, a nineteen-year-old farm wife; Dori, a lakeside innkeeper; and Glen, the director of the local land trust. Together with hundreds of others they cross cultural barriers and learn to help one another in an effort to win back the six-thousand-acre landscape taken over by Consumers Power that is now facing grave devastation. The result is a triumph of community that includes working farms, local businesses, summer visitors, year-round residents, and a network of land stewards. A work of creative nonfiction, Saving Arcadia is the adventurous tale of everyday people fighting to reclaim the land that has been in their family for generations. It explores ideas about nature and community, and anyone from scholars of ecology and conservation biology to readers of naturalist writing can gain from Arcadia’s story. Heather Shumaker has worked in land conservation for two decades and was coastal program director for protecting Arcadia Dunes. 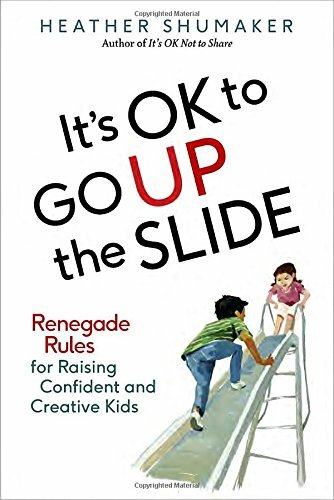 She has a master of science degree in land resources from the University of Wisconsin-Madison and is a national speaker and author of It’s OK Not to Share and It’s OK to Go Up the Slide. She lives in northern Michigan with her family. When it comes to parenting, sometimes you have to trust your gut. Shumaker also offers broader guidance on how parents can control their own fears and move from an overscheduled life to one of more free play. Parenting can too often be reduced to shuttling kids between enrichment classes, but Shumaker challenges parents to reevaluate how they’re spending their precious family time. This book helps parents help their kids develop important life skills in an age-appropriate way. Most important, parents must model these skills, whether it’s technology use, confronting conflict, or coping emotionally with setbacks. Sometimes being a good parent means breaking all the rules. Par enting can be such an overwhelming job that it’s easy to lose track of where you stand on some of the more controversial subjects at the playground (What if my kid likes to rough house—isn’t this ok as long as no one gets hurt? And what if my kid just doesn’t feel like sharing?). In this provocative and enlightening guide, Heather Shumaker describes her quest to nail down “the rules” to raising smart, sensitive, and self-sufficient kids. Drawing on her own experiences as the mother of two small children, as well as on the work of child psychologists, pediatricians, educators and so on, in this book Shumaker gets to the heart of the matter on a host of important questions. Hint: many of the rules aren’t what you think they are!